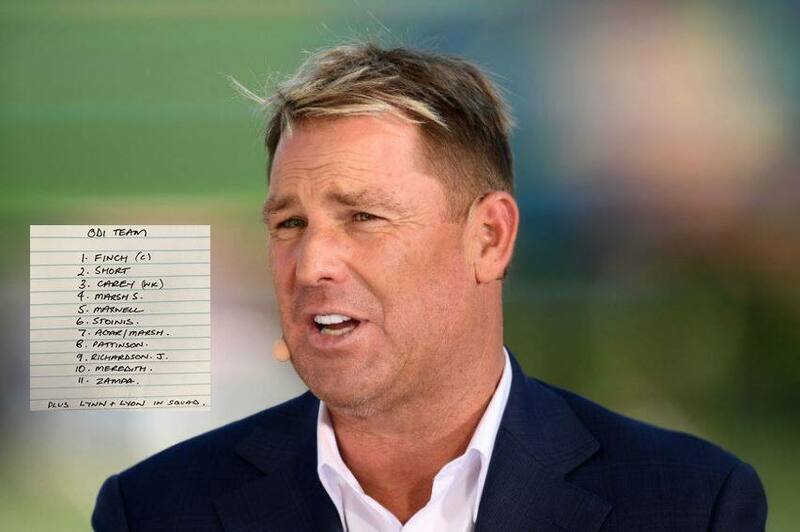 Former Australian Spinner Shane Warne slammed Australia's selection for the One-Day International series against India, by saying it as ridiculous. The squad was announced on Friday, January 4, which consists of veterans like Peter Siddle, Nathan Lyon, and Usman Khawaja, leaving out the likes of in-form D'Arcy Short and Chris Lynn. Former Australian spinner Shane Warne slammed Australia’s selection for the upcoming One-Day International series against India, by saying it as ‘ridiculous’. The squad was announced on Friday, January 4, which consists of veterans like Peter Siddle, Nathan Lyon, and Usman Khawaja, leaving out the likes of in-form D’Arcy Short and Chris Lynn and that is what surprised Warne. “I cannot believe that D’Arcy Short has been left out of the side,” Warne said. “I don’t know what he’s done wrong. He can bowl and his batting at the top is dynamic. He’s in terrific form, and he and Finch make an awesome partnership at the top. “When you’re picking this team you want to look at some players you are interested in, but you’ve also got to look at those players with the World Cup in mind and the conditions you’re going to have in England. Those conditions are going to be flat wickets that will probably spin a bit, so you need clever bowlers and you need some bowlers with pace. And they’re little grounds. So a mixture of power hitting and people that can bat time; you need that right combination”, he added, while elaborating his picks to Fox Sports. Warne also said it’s not fair in keeping Peter Handscomb to be named in the Australian sides despite failing to live up to the expectations. He was dropped off from the third Test against India, but made a return to the XI for Sydney, and also finds a place in the one-day squad. “I don’t think it’s fair on Peter to keep putting him out into the international arena, even for the Sydney Test match here,” he said. “Whether he makes 100 or 200, it’s still not the right selection or the right message that you’re sending to the rest of first-class cricketers. “Lynn is there if you need a bit more power at the top, then I’ve got Nathan Lyon that I’d like to see with the white ball as well at some stage,” he said while backing his view on having Lynn in the ODI squad.